The Christmas season just got a whole lot merrier for vintage lovers! 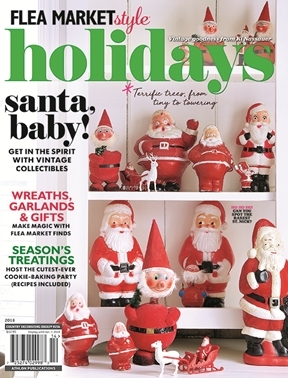 This debut issue of Flea Market Style Holidaysis packed with ideas, inspiration and more vintage goodness from Ki Nassauer. • Tour five amazing homes decked out in all things vintage. The looks range from glam to rustic—and one that’s just-for-fun in pink. • Invite the girlfriends over for a cookie decorating party. Celebrity baker, entertaining expert and author Jenny Keller sets the scene. Bonus: Get Jenny’s yummy sugar cookie and buttercream frosting recipes. • Craft away! Whether you have 20 minutes or a day, our clever junkovers will bring some new “old” into your holiday decor. Think oil funnel trees, a printer’s type tray advent calendar, ornaments using mini tart pans and rickrack garlands. • Make gift-giving extra special with our easy toppers using scavenged items. Chenille letters from old letterman’s jackets and discs from a cookie press are among the clever embellishments. • Revisit Christmases past—and maybe make “Christmas Card Bingo” part of your festivities. Readers and Flea Market Style Holidaysstaff share their favorite traditions that are sure to stir your own memories. • Plus: Shop our elves’ 12 gift ideas with a vintage twist. Learn readers’ favorite methods to get silver pieces holiday-ready. Plan your next road trip with our state-by-state listing of favorite flea markets and vintage shows.